Trident Fail-Safe Close Submersible Actuator for pump discharge installed on a 16" Cone Check Valve used in the main sewage pumps of a waste water pumping station. MIH was the first to develop an electro-hydraulic unitized fail-safe system. Trident Actuators can be designed to be fail-safe, submersible and explosion proof to meet rigid fail-safe requirements demanded by the complex water systems of our customers. Trident Actuators with fail-safe rotary and linear actuators have nitrogen charged accumulators that deliver fluid to return a valve to its safe position, whether open or closed as specified by the customer. The return to the safe position occurs automatically if the system suffers a loss of power or upon receipt of a control signal (e.g., from a seismic sensor). The system produces the full thrust necessary to seal the valve. The emergency operation speed is independent of the normal operating speed and field adjustable. Additionally, safety devices are provided in the actuator and controller to prevent damage to the valve and actuator and alert the operator in the event of an interruption of normal operating conditions. Trident Actuators are renowned for reliability. They are designed and built to operate flawlessly in the harshest environments on earth. 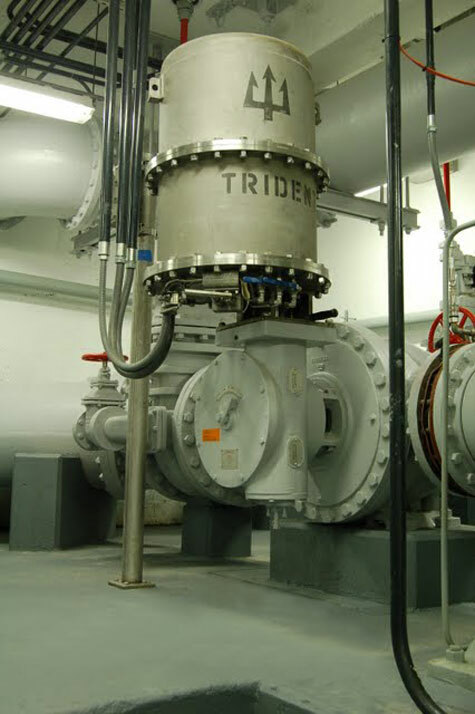 As a result, Trident Actuators are in use in water treatment plants throughout the United States. Prospective customers are encouraged to speak with any purchaser of a Trident Actuator and confirm the reputation for reliability that is the hallmark of every Trident Actuator.